I found out that Horsman made the Cindy doll (a fashion doll) as a ballerina with various hair colors including platinum, pink, and jet black! The bottom of the foot of these dolls has patent number 2,791,063 which is supposed to cover the doll's jointed knee mechanism. Some of these dolls also had a patent number on their backs below the waist - 2,736,135 which apparently refers to the hip joint. Also, the ballerina version of these dolls had different feet than the rest of the Cindy fashion dolls with a unusual method of ankle joints. During the 1950s women and children were experimenting with hair styles and colors. It was becoming acceptable, and even fashionable, to have dyed hair. 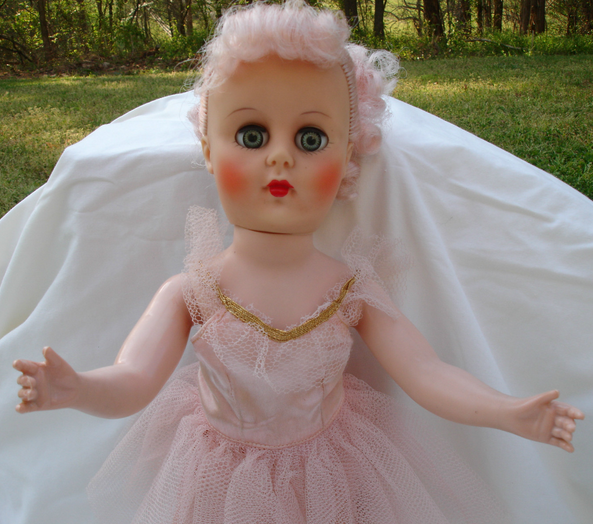 Dolls, especially the small walking dolls and the larger ballerina dolls, often had pink, orange, blue. green and other colored hair. Children loved it.